After the Coronation, the Suppressed Frame equipment was dismantled and reassembled in the new Telerecording Suite at Lime Grove, alongside the Moye-Mechau system. For many years I had forgotten what the "driving wheel" was for, and then Peter Legate, who had been a member of the team from Research Dept who had operated the equipment when it was at AP on Coronation Day e-mailed me early in March 2002 with the answer. This maintained the correct phase relationship between the displayed field on the tv monitor and the recording camera. In other words, a large "racking knob". He says, "It was given such prominence on this particular equipment because, (I believe I'm right in saying) the waveform generators of the many OB sources used on the Coronation transmission were not all, if any, locked together. Hence a cut from one source to another during the programme resulted in the 'new' signal appearing in any old phase relative to the one before. This did not worry the majority of the receivers in use at that time, but some took several seconds to settle down. The same applied, more or less, to the suppressed frame recorder and the operator was kept pretty busy winding the frame bar out of sight!" The Moye-Mechau system used a Mechau mirror drum and a Moye film camera to record both television frames. Before each and every recording session, the mirrors in the drums were cleaned (there was an access hatch in the drum for this). I'd now moved from Telecine to Telerecording and on one occasion before a recording session when I was industrially cleaning and polishing these mirrors I flippantly mis-quoted a bit from Shakespear's Macbeth: "Out out, damned spot - what, will these mirrors ne'er be clean?" Which prompted a "Clot!" from the supervisor, Ivor Smith. Ivor had a very loud speaking voice which no doubt led to his becoming known as "20dB Smith". Sound was recorded as before on the same film, but unlike the original Mechau telefilm gear at AP which had a simple variable density glow-lamp arrangement, each unit had a very good quality sound system. One was RCA, the other BAF, both producing variable area tracks. RCA = Radio Corporation of America. BAF = British Acoustic Films. One day, while operating the Moye-Mechau system we were recording a Test Match - but it wasn't just any test match, it turned out to be the one in which England won the Ashes for the first time in many years. As it happened, my machine was recording just at that moment, and I noticed that although I should have cleaned the monitor just before, I'd forgotten to wipe off my dirty handmarks..... So for many years afterwards, whenever that historic moment appeared on television, I could see my dirty handprint. Such is fame - or should it be notoriety....? 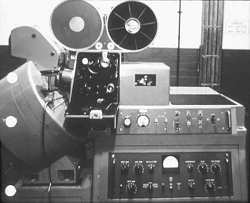 There was, though, another telerecording system (of sorts) we had at Lime Grove - this was a 16mm system just for making check recordings for in-house "post-mortem" use so that people like producers and artists could review their work. 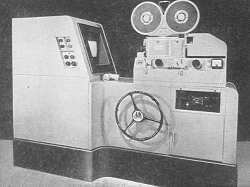 To keep it as cheap as possible, it didn't run at 25fps, but at 16 2/3rds fps, and consisted of a couple of ordinary Siemens 16mm projectors enclosed in wooden light-tight boxes and looking at ordinary production tv monitors. A glow-lamp was installed where the exciter lamp would have been, to record the sound as a variable density track. A truly "Heath-Robinson" (in American that would be "Mickey Mouse") arrangement. Yet the results were "viewable"! A complication was that although these recordings were made at 16 2/3rds fps, the 16mm projectors in the viewing theatres at Lime Grove didn't run slower than 18fps, which made music replay "considerably sharp"..... So on at least one occasion, when Bernard Braden and his wife Barbara Kelly were wanting to see one of their comedy shows they were invited up to Telerecording where there was a projector able to run at the correct speed. Barbara Kelly said that she thought they had come to the "holy of holies". I was once asked if the system used 16mm reversal film and I had to confess that my memory was completely blank on that point. To keep the process as cheap as possible it would have been logical to use reversal film, as no printing costs would have occurred. So I think it is safe to assume that this was the case. Not many of these recordings survive. After I moved from Telerecording back to Telecine (for a reason I have now completely forgotten), a colleague (Donald Pickering) saved one of Arthur Askey's "Before Your Very Eyes" programmes, with on the front of it his own (silent) film, also shot at 16fps, of a tour of the Telerecording Suite, showing "how it was done". Having lost contact with him in the mid-1970s I cannot say if it still survives, since he has since died, and I have no knowledge of what hppened to his films. 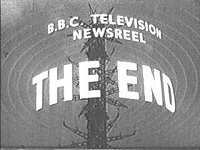 In 1954 News Division, responsible for all the radio news, wanted to take control of news on television, so the much loved TNR was axed and "News & Newsreel" took its place, and initially it used a similar opening title, the letters going round the mast, instead of "BBC TELEVISION NEWSREEL" were now "BBC NEWS AND NEWSREEL". But TNR didn't just stop without a cry. Just before News Division took over tv news, the very last Television Newsreel ended in style! News & Newsreel came from Studio A at AP. A new Telecine room had been built and had a nice 35mm Philips cinema projector but the 16mm machine was mounted on Dexion angle iron and each looked into (I think) a Pye tv camera. I was actually off duty the day it started, my shift not being on until Day 2, so I watched the, I have to say, rather inferior results in the BBC Hostel that evening. "News & Newsreel" had just one daily transmission at first, and that was at 7.30pm, so after transmission everybody at AP went home. One day, though, for some reason lost in the mists of antiquity, the main television sound feed to all transmitters throughout the country was, at some time during the day, inadvertently re-routed via AP racks.